I ride horses, and the isometric contraction makes my back very tight. After my medical massage, not only was I able to sleep, but I also had a greater range of motion through my seat, pelvis, & shoulder, all of which helped improve my riding. Lara M, Washington, D.C.
My body has been wracked with pain for the past year. I have a lumbar injury, plus in the past year Iâ€™ve had 4 surgeries for breast cancer, 6 months of chemotherapy and 8 weeks of radiation therapy. I also work full time and I have 3 school aged sons at home. Iâ€™ve been taking lots of pain medications just to make it throughâ€¦ one day at a time. Iâ€™ve needed some SERIOUS one-on-one rehabilitation, and physical therapy clinics just donâ€™t provide that much attention to their patients needs. A friend referred me to RHOA, and I made an appointment via their website. I was very impressed that my medical massage therapist uses ETPS therapy in conjunction with deep tissue massage. I have had this therapy in the past upon recommendation from my Neurologist/Neurosurgeon about 4 years ago. This is a relatively new therapy and few therapists are qualified to use it. This therapy LITERALLY saved me from having back surgery in 2004. Thanks to my medical therapist, I feel so great with my health. I come down to Kingsland from N.J. And never miss a chance to visit her. Thanks a lot. Ket H., N.J.
â€œMy medical massage therapist is a very gifted and special person. She has mastered the process of identifying the individual needs of her clients and applying her experienced hands that produce results. Audrey and the staff of RHOA have made a huge difference in my quality of life. Thank You!â€� Jim L.
I have had massages before but they are what I call the "feel good" ones....they feel nice at the time but they did not do anything about the problems I was having. My neck and shoulder area hurt all the time and I had difficulty turning my neck as I should. God has given you a gift that sends your hands right to the place(s) that really need stretching out. And for me, not only are you working on tight muscles you ask me what am I doing or not doing? How am I sleeping? sitting? Small things I would not think about that doing some small changes have helped the way I feel. All my muscles thank you for the attention they receive from you!! 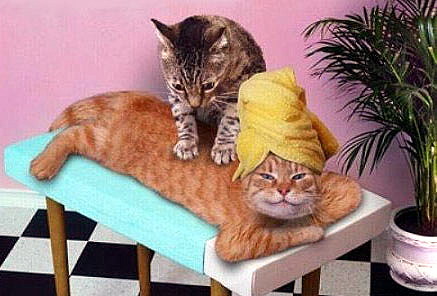 I gladly tell my friends to " go to my medical massage therapist, she will work on you real well!!" You take care of all of us - working us all in when we call (at times over doing yourself). God Bless and we (Jo and I) will see you soon. Prayerfully, Sharon C. FL"
After you worked on me, I had no pain in my leg. I had this pain for years. Thank you. K.L.